Multisensory Brand Experiences and Brand Love: Myth or Reality? 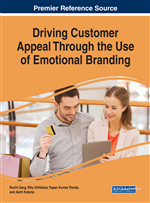 In this chapter, the author examines the most important research in the field of sensory marketing, brand equity and brand love, that has been published over the past thirty years. Firstly, the author accounts for the significance of the five senses and sensory marketing which is regarded as a new marketing paradigm for the 21st century. Secondly, brand equity is discussed as a multidimensional concept, highlighting the pivotal role of emotional and sensory associations in creating a positive brand image and strong brand equity. Thirdly, brand love is analysed as an emerging brand-relationship concept in the field of experiential consumption. Fourthly, the significance of multisensory brand experiences is discussed as a means of making brands stand out in a competitive environment and inducing feelings of love towards a brand. Finally, brand sensoriality is pointed out as central to conveying experiential brand values through multisensory brand experiences, in several encounters. Over the last few decades, marketing has evolved dramatically from an essentially transactional to an experiential approach, in which multisensory brand experiences have started to play an important role in the value-generating process (Rodrigues et al., 2011). Nowadays, brands are highly similar in functional terms and, therefore, functional values have become less sustainable as a form of differentiation (Brakus et al., 2009; Delgado-Ballester & Sabiote, 2015). Moreover, consumers are aware and informed as never before and take for granted that brands should be trustful and maintain quality standards and functionality.